The Duchess of Cambridge joined the Queen at King's College on Tuesday. Source: Getty. She has been a prominent member of the British royal family since she tied the knot with Prince William almost eight years ago, but the Duchess of Cambridge has only just carried out her first joint engagement with Her Majesty the Queen. 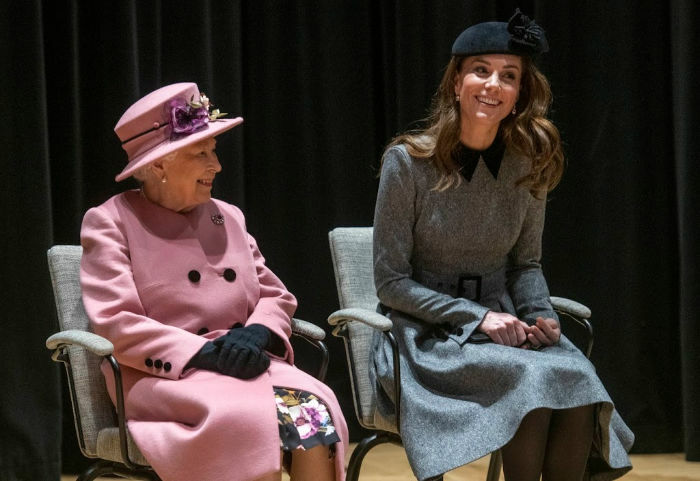 The duchess attended King’s College London with Queen Elizabeth on Tuesday morning, marking Catherine’s first ever solo engagement with the monarch outside of the palace walls, having previously been joined by Prince Philip for all other duties. Mother-of-three Catherine looked elegant as always for the outing as she wrapped up against the cold in a belted grey coat dress, which she paired with thick black tights, a black fascinator and classic black heels. While the Queen stood out in a vibrant pink ensemble, complete with her signature hat and handbag and a trusty pair of her favourite black court shoes. The pair appeared to be in high spirits as they laughed together. Source: Getty. The royal duo officially reopened Grade II-listed Bush House at the top UK university, which previously served as the headquarters for BBC World Service. During the visit the pair met with donors, supporters and alumni of the university – one of the top 25 in the world – as well as being greeted by crowds of well-wishers who had gathered outside in the hope of catching a glimpse of the royals. Catherine and the Queen shared a blanket together in the back seat. Source: Getty. Later that day, Catherine also carried out a solo engagement as she visit the Foundling Museum and met with a group of ‘Tracing our Tales’ trainees, whom she first met back in 2017. The visit coincided with the announcement that the duchess has been made Patron of the museum which tells the history of the Foundling Hospital, the UK’s first children’s charity and public art gallery. In 2017 The Duchess of Cambridge visited the @FoundlingMuseum and met the first intake of ‘Tracing our Tales’ trainees. Kate’s sister in law Meghan, Duchess of Sussex, didn’t have to wait nearly as long for her first solo engagement with the Queen however, as the heavily pregnant duchess joined the family matriarch for an official outing just one month after she married Prince Harry in May last year. The pair oversaw the official opening of the Mersey Gateway Bridge and Chester’s Storyhouse Theatre in June 2018, before enjoying lunch at the historic Chester Town Hall with dignitaries. Did you know Catherine had never carried out a solo engagement with the Queen? Do you like to see the Queen out with younger members of the royal family?